After its launch two years ago, the good-quality, pure and simple Staray case with its intensive Apollish light effects has successfully established itself on the market. Due to its excellent price-performance ratio, the midi tower is still very popular amongst end users as well as professional system builders. To open up new target groups, Enermax decided to extend the case series with two new models. 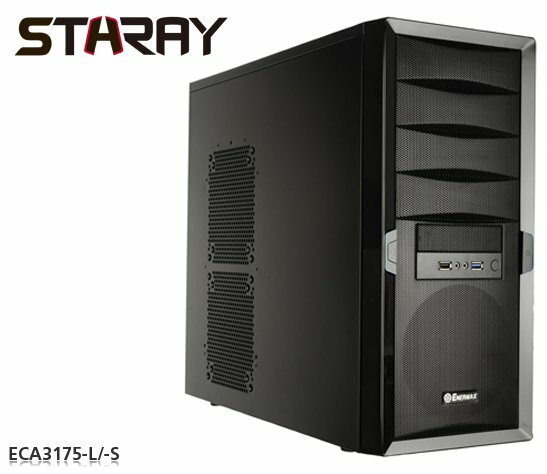 The new Staray model ECA3175-L is a low-budget midi tower with basic equipment. Compared to the first version ECA3170-BL/-BR, the exterior design remains mainly unchanged: The clear shapes and the stable, air-permeable mesh front meets the public taste and does not follow short-term market trends. ECA3175-L is delivered with a powerful 12cm front fan and can accommodate up to three additional fans at the rear and at the side. Thanks to the USB 3.0 front interface, the new Staray model also supports the latest high-speed standard. The port can be connected directly with an internal 19-pin connector, so that the inconvenient cable routing through the back of the case can be avoided. The second newcomer is directed to users of silent PC systems. The ECA3175-S is equipped with the extremely popular T.B.Silence fans. They offer a perfect balance between cooling performance and noise generation. Enermax delivers the midi tower with two 12cm T.B.Silence fans - one in the front and one at the back of the case. Furthermore, the manufacturer has modified the case interior: It is coated completely in black and comes with a cut-out behind the mainboard tray to simplify the CPU cooler installation. USB 3.0 belongs to the standard equipment of the new Staray version. ECA3175-S provides two high-speed USB 3.0 interfaces with internal 19-pin connector.